Phew! Let’s just say the world record is safe enough, for now. It is hard to get back into a routine. Running is like any hobby. Like blogging, even. Once the routine is broken it can be quite hard, for me at least, to get back into it. I am pretty sure being friendly would seem like a chore if I didn’t practice it on a regular basis. I don’t think there is any real knack to making friends or being friendly. It’s just one of those things, use it or lose it. Another thing we will lose if we don’t use is the right to say “No”. As some of you will know I had my own experience of standing up to the man. The lack of foresight in most people today is scary. They don’t seem to understand that saying nothing registers in the mind of a government as saying “Yes”. That is the reality of politics today. And very very soon the “system” will be running the show, not the politicians, not the lawmakers, not the people. We will be all so brainwashed into a certain way of living that changing the system won’t even enter our heads. Having a choice won’t enter our heads. I used to get so wound up trying to waken the world. Nowadays I just take it in my stride. I can’t compete with the might of the mainstream media and the 3D goggles. Perhaps if I didn’t have children I wouldn’t care so much. Being a parent I will always worry about my children and their children and the system we sign them up for. All my worries and stress seem to vanish when I am running. Perhaps it’s the heavy breathing. There’s nothing like gasping for air to focus the mind! Air is the fuel I need to live. And yet I didn’t appreciate it, most of the time. It was only since I started running a few years ago that I started to see air in a different light. Now I marvel at the stuff, especially running uphill, I can’t get enough of it. The London marathon is on telly tomorrow morning. It should be a good one. A star studded line up in both the male and female categories. My money is on the new kid. 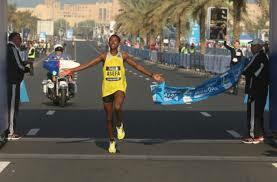 The eighteen year old Ethiopian, Tsegaye Mekonnen, ran his first marathon in Dubai back in January in a time of 2hrs 4mins 32secs. He won that race. Crazy speed for a first timer! Even crazier, he says he could have ran faster. Luckily for Tsegaye I have signed up for a local half-marathon race tomorrow afternoon. I could have put the cocky little youth back in his place. Dream on. But I will take comfort from knowing that we both use the same fuel. Hey…just realised, we are all connected after all. All together, breathe in…hold…and breathe out. This entry was tagged air, breathing, Daily prompt, Ireland, life, london marathon, oxygen, politics, purpose, Running, truck, trucker, writing. Bookmark the permalink. The pom-pom’s will be a shaking tomorrow Frankie. You can do it. Beathe in reallll deep then out. lol Good luck and yes, lucky for that cocky little youth guy! 🙂 Above all – have fun. And, about the “other stuff”. I feel exactly the same way. One reason we are heading back down south. A simpler life where most people there understand the value of just breathing. I am tired of talking to deaf ears. I am very happy my sons understand the truth. Your new simpler life will be great. I was only acting the maggot 🙂 I did a half marathon in Ireland while the London marathon was the big event across the water. I couldn’t agree more. The hard part is keeping motivated. The more I do it, the more I want to and the easier it is. The less I do it, the harder and less motivated I am. Hugh. I went to like this, then realised I already had. So in the spirit of being annoying I decided to like and un-like it several times in the hope that it would set your notifications off. I didn’t realise I could unlike and like again. Your second like popped up…it was so annoying. Not.